Both free and enterprise versions of Google Apps Directory will allow you to add a ‘search widget’ to your site, where visitors can search through your Google Apps directory information to find members of your staff. 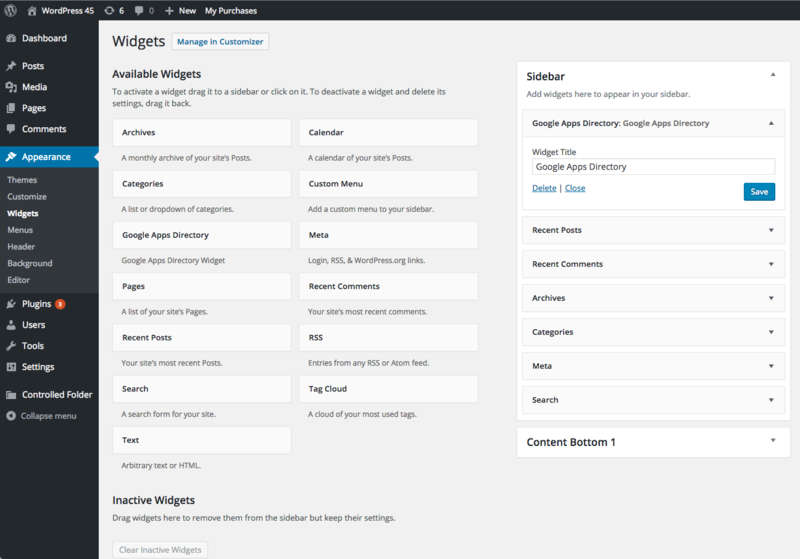 In Appearance -> Widgets within your WordPress admin panel, drag the Google Apps Directory widget to a sidebar of your choice. You can add a title to display above the widget if you wish. A search box should now appear in the sidebar on any published pages that include that sidebar in their template. Enter any text (e.g. a person’s first name) and press enter. 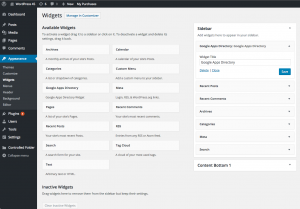 The widget will display any matching users from your Google Apps domain – note they don’t need to be WordPress users in order to be found (in fact, WordPress users who are not in your Google Apps domain will not be found). It is possible to write custom code to add extra fields to the search output – see our API docs. There is an option to allow only logged-in visitors to be able to utilize the search widget. To change this setting, go to Settings -> Google Apps Directory. There is a setting in the Main Settings tab labelled ‘Allow logged out users to view your Directory’. Check this to allow all users to search; uncheck to restrict usage to only logged in users. Click Save Settings. In the Enterprise version only, there is also an option labelled ‘Enable search widget’. You can uncheck this to completely remove the widget from your site. This option is provided so that you as admin can ensure other users do not add the search widget to the site (or you might have done so accidentally). This option isn’t relevant in the free version of the plugin since the search widget is the only feature of that plugin – if you don’t want the search widget, you would just deactivate the free plugin!